Blowing up and drilling mountains may sound like fun but cleaning off the equipment can be a hassle. Baxter Drilling Company had been using a competitors recycling system to handle the wash water from their cleaning, which most companies are forced to do to stay within State and Federal Regulations. The unit stopped working, leaving the Drilling Company with no way of handling the wash water. Enter Charlie Dunkleberger, Branch Manager of Superior Cleaning Equipment, San Diego, California. Upon reviewing their equipment, Charlie suggested they replace it, given the current state and the fact that previous repairs by outside companies did little to nothing to remedy the issues. They already had a pressure washer rated at 4 gallons per minute (GPM), a failing recycling system and a budget of $25,000. They opted for the Water Maze CL-304A, a skid mounted unit capable of pre-treatment or recycling wash water. The CL-304A is capable of recycling up to 5 GPM, perfect for their current pressure washer. On top of the new recycling system, Baxter Drilling also purchased a (used) 850 gallon water tank for settling and a SCE Bypass-It pump protector to pro-long the life of their pressure washer. 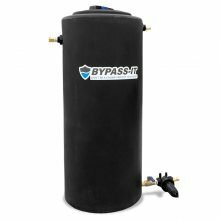 The better way of protecting your pressure washer pump! 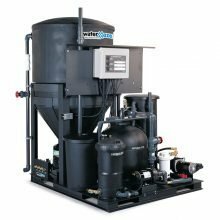 Capable of water pre-treatment, sewer discharge, or recycling wash water. Baxter Blasting Company began with the dedication and determination of a young man named M.J. Baxter. M.J., affectionately known to his friends and family, as Mickey, was working in the mining industry in Colorado when destiny brought him to California in 1942. Seeing the need for this growing industry in the San Diego area, Mickey started MJ Baxter Construction Company in 1946 and began working on pipelines, roads, tunneling and quarry projects. At that time, Mickey expanded the business to include drilling and blasting and formed the corporation now known as MJ Baxter Drilling Company. Today, they are the premier drilling and blasting company in the San Diego region. Learn more about Baxter Drilling Company by visiting their website. This entry was posted in Customer Spotlight. Bookmark the permalink. ← Our Service Department is Going Digital!